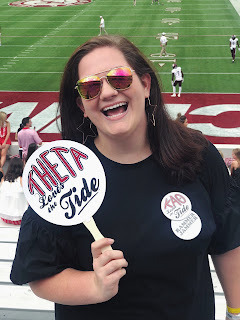 After I saw Frannie's post, I was very inspired to saw y'all what I would wear to a football game. If I wasn't required to wear a polo and jean shorts. Slightly #salty... A lot girls at my school wear the same thing to games. High waisted shorts. A school tshirt. White converse. I do love the outfit (expect one soon), but I don't like it if everyone else is wearing it at the same place. In Georgia, it gets hot. Last Friday, the heat index was over 100. Your ultimate goal is to look cute and not sweat yourself to death. Jeans are a no go until October (maybe) in Georgia. Sleeveless shirts are the way to go and so are shorts. Jacks are great shoes if you've broken them in all the way. Add a bow in your school color and you're ready to lose your voice screaming your heart out for the team. This outfit is perfect unless you want to go all out with face paint and all your school colors. I approve of that too.